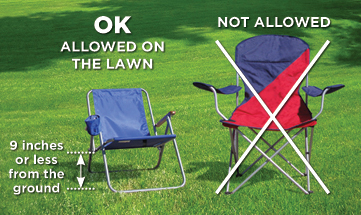 No chairs over 26" high (please see graphic below). One child (age 12 and under) free with each paid general admission ticket. Make sure to add child tickets to your online order. General Admission tickets are for festival style seating on the North Meadow. A very limited number of Reserved tickets are available for sale online only. Concerts are rain or shine, so please be prepared for inclement weather. All tickets are non-refundable. Tickets for sold out shows may be resold through Lyte. Concert tickets do not include regular zoo admission. Most, but not all, artists travel with merchandise to sell. Children must be supervised at all times. There is a Kids' Area at each concert, staffed by Seattle Gymnastics Academy. The main entrance to ZooTunes is at the West Entrance to the zoo. Please consider riding the bus, biking, carpooling or walking when visiting the zoo or attending a concert! To West (ZooTunes) Entrance: 5500 Phinney Ave. N.
From the North, take I-5 south to NE 50th Street (Exit #169). Go west 1.3 miles to the South Gate at N. 50th Street and Fremont Avenue North or the West Entrance off Phinney Avenue between N. 55th and N. 56th. To South Entrance: 750 N. 50th St.
From the South / Downtown, take I-5 north to NE 50th Street (Exit #169). Go west 1.3 miles to the South Entrance at N. 50th Street and Fremont Avenue N.
By bus: For detailed Metro bus routes and information, go to: Metro Transit Online or call 206.553.3000. By bicycle Secure bicycle parking is available at the West Entrance to the zoo. By carpool: A limited number of premium spaces are reserved for carpool vehicles in the zoo’s North lot on a first-come, first-served basis. Rideshare: Woodland Park Zoo has partnered with Rally, a bus rideshare that makes it easy to get to-and-from events by using crowdsourcing technology. And buses are the most energy efficient way to travel -- the planet thanks you! Book a Ride and use code ZOOTUNES for $5 off your ride to any Zootunes show this summer. Pay-for-parking kiosks are located at each lot. Disabled parking is available in all zoo lots. $18.00 for buses, RVs and other oversize vehicles. New: Light & Charge electric vehicle charging stations. Four charging spots available on a first-come, first-served basis in the Otter lot. Parking and charging fees apply. Penguin Lot at Phinney Ave. N. and N. 55th St.
Flamingo Lot at the intersection of N. 50th St. and Phinney Ave. N.
Hippo Lot at the intersection of N. 50th St. and Fremont Ave. N.
Additional parking is located in Lower Woodland Park at N. 50th and Aurora Ave. N. about .1 mile from the South Entrance. If you park in residential neighborhoods, please be courteous and do not block driveways.